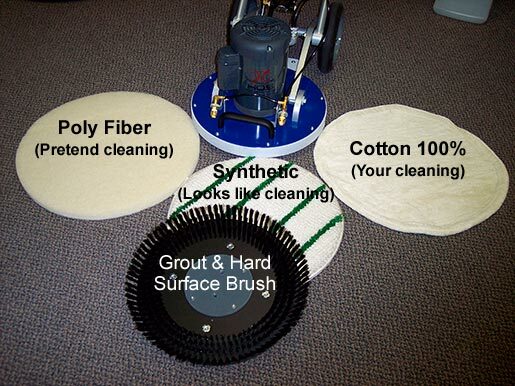 Great for carpet cleaning and hard surfaces including grout. Try wearing a (poly) or (synthetic) or (cotton) shirt and you will quickly understand the difference in absorption. has anyone used this machine? i see the new model has a sprayer setup on it. is this as good as padman's machines or is it better? i want to get an OP machine and hope to get the best. thanks. This unit is new to Kleen Kuip but I feel it's manufacturer is totally dedicated to this method of cleaning and has impressed us in the past. So far I like what I see and the Orbot handles with ease. They have also offered a new weight system for making it more effective on hard surfaces such as hardwood sanding or marble finishing etc,. I will be testing these weights next week and will let you all know. How many steamers with a truckmount investment can top that? The price for the Orbot as of today is $4,150.00 which is less than $4.00 per day over a three year period. OP continues to ROCK for those who have the forsite to allow it into their methods of cleaning. I have used a pre-release model that was sent down to Australia last year. hello cf- what where you padding with before? have you used CCS machines and did they work fine? just wondering. hello ted- any feedback on the performance of the orbot yet? i'm still trying to decide between it and the ccs machines. any info would be greatly appreciated.thanks. Sorry so slow getting back to you. I established my business years ago using strictly rotary machines with the use of various bonnets and pads . Durapads ,cotton bonnets, combo pads ,and my faves Gladiator pads from CCS. Which pads I used was dictated by each job. Some jobs required more aggressive attention -so I start with say durapads followed by glad pads. I have 3 rotary machines(Nobles, Tornado, PowrFlite brands) all of which are sidelined now due to my Orbot purchase. I was looking for a better method of low moisture cleaning machines and had my eye on CCS for a year or two and just had never got around to following thru after looking. Then Vacaway (I use some of their chems) became a distributor for this Hruby Orbot . I checked it out and talked to Steve Smith on the phone at length and pulled the trigger. Whether this machine is any better than CCS machines -I wouldn't know first hand - but I doubt it. They're both orbital, both made well. Pick one ! I'm extremely pleased with the results I get with far less work than using rotary equipment - that was my original objective . Also use CCS VLM Abstraction -it is great as well. The Orbot has a couple features that were appealing also-ergonomic grip and flexible height adj ,ease of use with its 10 inch wheels,upright folds down to 30 inches or so in height and the entire cord can also detach. Let me know if you have any questions. hi CF. 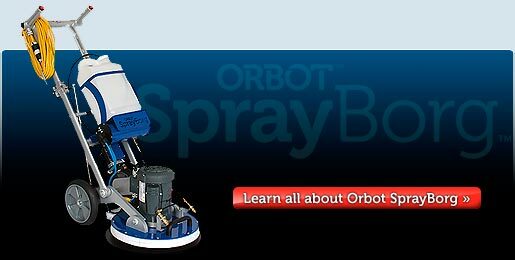 just wanted to know if the orbot is a high speed machine like ccs makes. it looks similar to yhere 17 in. brute machine. not too sure what the speed of oscillation means. rick. The Orbot simulates 1700 RPM and you can put a disk on it up to 21 inches. No the Orbot is NOT a high speed, but it is an orbital. Challenger and Orbot both utilize the standard speed orbital counterbalance. Soon I will expose the truth about this in a way that people can understand. please explaine padman i am looking to purchase an OP machine right now and like i said i would like to get the best. all i can see on this board is that anyone who has got an orbot loves it.not to many people talk about your ccs machines. i know d**k about either one. that is the only reason why i'm inquiring.please give me some info. thanks. The main difference is SPEED of cleaning. For example, what ever speed standard oscillation cleans at, high speed cleans 40% faster. So the question is, how much money do you want to make an hour? $100 or $140? Depends on where you live too.